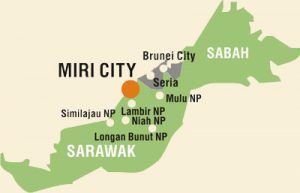 Located near Kuala Baram River Mouth, a pleasant scenic coastal drive along Miri-Kuala Baram Road from Miri City Centre will take you there in 20 minutes. Come face to face with more than 1,000 Estuarine Crocodile (Crocodylus Porosus) and Malayan Gharial (Tomistoma Schlegelii) in a 22 acres land, which also houses a mini zoo with Sun Bears, Hornbills, Borneo Gibbons etc, together with a family farm house with cattle, horses, rabbits etc. It will provide an enlightening & awe-inspiring experience for individuals of all ages.